Perhaps you’re caring for an elderly parent who can’t take capsules or tablets. Perhaps your child hates the taste of medicine. Or perhaps you’re allergic to a filler, dye or binder commonly used in mass-produced medications. What if you need medication in a strength that isn’t commercially available? What if it’s been discontinued? We’re your Beacon for the solution: Compounding. It’s the art of customizing medicines in easy-to-take forms, based on each patient’s unique requirements. Our pharmacists work closely with you and your doctor to prepare the precise dosage for your body, in the best way for you to take it. You won’t find this service at just any drug store. Compounding requires special training, technology and supplies. 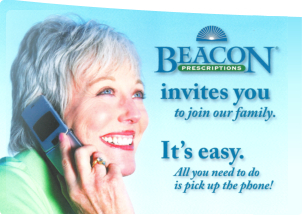 Your Beacon Prescriptions pharmacist has the knowledge and experience to fulfill your unique needs for medication. Almost any kind, including hormone replacement therapies, dental preps, pain management, veterinary, pediatric drugs and more. How are medications compounded? We start with bulk powders. We have thousands of chemicals and drugs available to us, including many hard-to-find medicines. Just about everybody. If you have allergies, we can create dye-and preservative-free medicines. When you want to rejuvenate dry or oily skin, we can compound biocosmetic products that also reduce rashes and irritations. Athletes, coaches, trainers and “weekend warriors” can use compounded medications to reduce inflammation and relax muscles – without the side effect of drowsiness that can affect performance. From muscle spasms and fungus to hemorrhoids and tendonitis, we can prepare compounded solutions. Children have special needs. You can get precisely the right dosage for their height and weight. We can add flavorings to make the medicine taste better. Here’s good news for any one who’s ever tried to give medicine to a dog or cat. We work with your veterinarian to customize pet medications, making sure your pet gets the appropriate dosage. That’s important, since what’s right for a Great Dane may be too much for a ferret. And your pet gives a far different reception to a specially medicated dog biscuit or tuna-flavored cat treat. We have bulk supplies of veterinary medicines, for the whole spectrum of pet illnesses, including many drugs no longer commercially available. Is compounding legal and safe? Yes. The Food and Drug Administration says that compounded prescriptions are both ethical and legal, so long as a licensed doctor prescribes them and a licensed pharmacy compounds them. In addition, the State Board Of Pharmacy regulates compounding. Have your doctor talk with your Beacon Prescriptions pharmacist. Physicians often call us to find out about new medicines, since advancements come to market all the time. Together, we can make sure you get the best possible solutions. You’re looking for the right medication, taken the right way. Beacon Prescriptions is dedicated to providing high quality pharmacy services that result in optimal medication outcomes. We are committed to exceeding the needs of our patients and customers by providing efficient, caring, professional and cost-effective services in an environment that encourages excellence, teamwork, compassion and continuous improvement.